All Students Invited To Design 2018-19 Yearbook Cover! NOW HIRING!! Stoddert Extended Day Program (EDP) is now hiring for a part-time position that runs from 3:15pm-4:15pm Monday – Friday. Please send resumes directly to Coach V at extendeddayprogram@stoddert.org. All questions should also be sent directly to this email address. 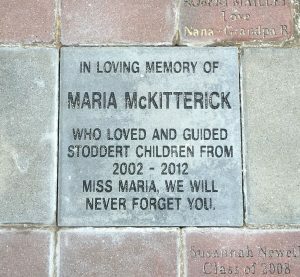 The Commemorative Bricks Are Installed! Ward 3 – Wilson Feeder Education Network presents Ward 3 State Board of Education Candidates Forum with Dora Currea and Ruth Wattenberg, moderated by WAMU’s Jenny Abamu​ Monday, October 15th 7 pm – 8:30 pm Tenley-Friendship Library RSVP to w3ednet@gmail.com if you think you will attend.